I’d been wanting to try this adventure for awhile: going for a bike ride along the recreational pathways in my home town. 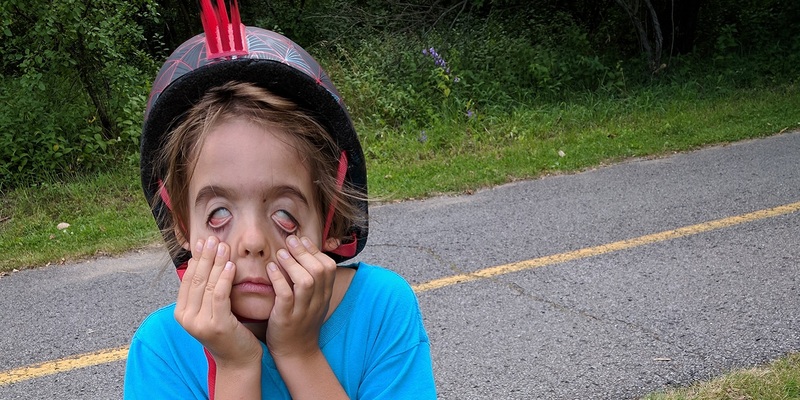 Admittedly, I was already biking to work (along the wonderful Voyageurs Pathway), but I was a little apprehensive about trying it with my family. Knowing my kids as I do, I KNEW we’d run into a few snags. Would we have to give up halfway through because Henri, the youngest, incurred an open fracture of the tibia (i.e., a scratch) or lost the use of a finger (i.e., got a splinter)? Which we do. Well supplied with drinks, granola bars and nuts, we head west, more specifically to the wilds of Aylmer. The goal: to get to the beach at Des Cèdres Park, my favourite spot over the last few years. A 10K trip along the Voyageurs Pathway, a safe bike trail that’s far from traffic—and level all the way. Perfect for beginners. First observation: Don’t let the kids argue about their position in the queue. Dad in the lead, the kids in the middle, and Mom in the rear: that’s the ideal configuration to ensure you don’t lose any family members along the way. We follow the shoreline of the Ottawa River, which we can glimpse through the walls of our green corridor. At intervals along the trail are signs indicating beautiful lookout points. We decide to stop at one to check it out. Mag-ni-fi-cent. The cattails and loosestrife stretch towards the river as far as the eye can see. At our feet, hundreds of frogs hop aside to let us pass. I manage to catch a few, under the admiring gaze of my offspring. We hit the trail again. Not a word of complaint! My partner and I exchange incredulous glances. We do have to be on our guard: it’s a beautiful day and there are lots of cyclists. I’m surprised by the volume of traffic, but people pass us cheerfully. The trail is beautiful, and there are no potholes! 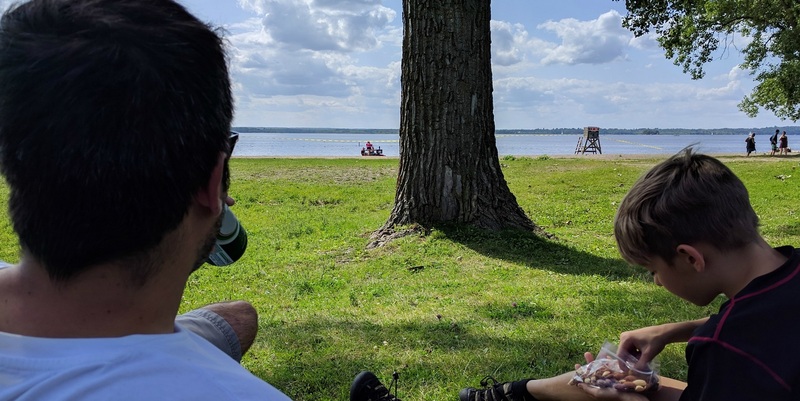 The kids find lots of excuses to stop: because they’re hungry or thirsty, obviously, but also because they want to admire the Deschênes Rapids and its famous wave (there are no surfers out today), or to take a closer look at swamps or parks. There’s so much to see! Des Cèdres Park. La belle vie. At last we arrive at Des Cèdres Park. The beach, the sailboats bobbing in the distance, the relaxed people strolling by—it’s like a whole different world! We nibble our snacks between Frisbee games, then hop back on our bikes to return home. Rather than retrace our steps, we take the bike path along Des Allumettières Boulevard. To get to it, there’s a small hill to climb. The bolder members of our group (my partner and our eldest) use pedal power, while my youngest (the one who almost lost his leg in a horrifying scratch incident) and I walk our bikes up the slope. Once we’re on the trail, it’s a piece of cake. The road is ours! It’s much less crowded than the Voyageurs Pathway. We arrive after … a 25K excursion, without a hint of fuss. For our first time out, it’s CONCLUSIVE. Visit the Gatineau, ville vélo website (content in French only). Come see us at the Maison du tourisme tourist information office. We’re very friendly, and we have lots of free information and suggestions for you! No bike? No problem! The Maison du vélo can rent you one for every member of the family.